Grandson Cooper is getting close to 16 months now. 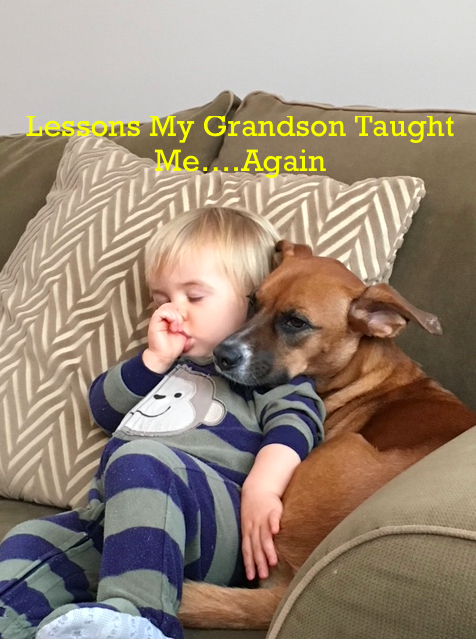 And with apologies for my very biased view of our newest family member, here’s the latest installment of Lessons My Grandson Taught Me. Everybody needs someone they can fall back on when they need a break. Cooper has fallen in love with Zoey the family dog and though there are times Zoey, at best, only tolerates her new little brother it’s clear she loves him too. Naptime would make all of us a little better. My grandson goes until he can’t go anymore – and when he crashes it’s with the same aggression with which he approaches life – all in. The “adults” among us seldom take the time to recharge – and we pay a price. Family is a lot more important than any of us realize. Little Cooper spent this past weekend with cousins, aunts, uncles, grandparents, and Mom and Dad – and we watched him wrap the love around him, joyful in the experience. He reminded me again that we take family for granted – but Cooper doesn’t. Just ask Zoey. Oh, there’s one more thing. When you walk out and gaze at the nighttime sky I hope you’ll take the time to appreciate the beauty there. I admit I had long since forgotten. How many times have we seen the stars after all? But this past weekend my grandson and I watched the panorama that reached into eternity with a very different perspective. I saw the magnificence – and it took my breath away. As we stood there in the darkness I pointed to the glowing beacon in the northern sky. And so the moon was renamed for all eternity. Rest assured Pop will hold onto the appellation – even when his grandson has moved on. Which takes me to the last lesson. The joys of life are simple – if we choose to make them so. We live in a world of abundance – and can grow satiated and complacent – until we take the time to look at it again with the wonder of a child. There are rumors we are growing closer to a Full Boo Pah this week. Cooper and I have big plans.